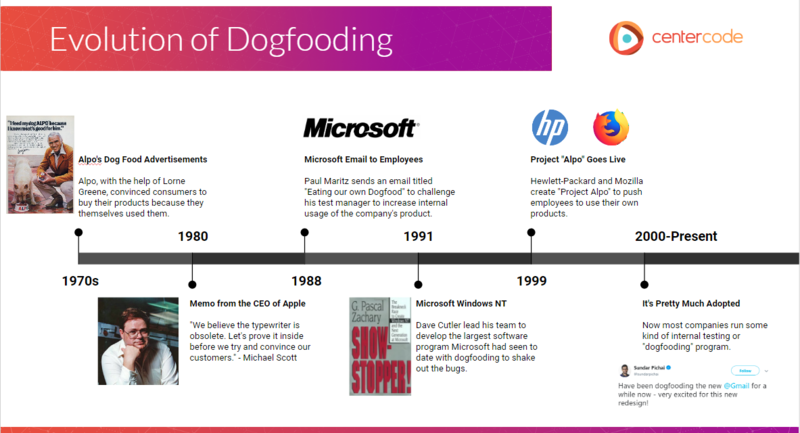 Summary: This brief overview defines the key concepts of dogfooding: what it is, the benefits it brings to an organization, when it occurs in product development, who provides feedback, and where dogfooding lives in an organization. Eating your own dog food, drinking your own champagne, eating your own caviar – some sound more appetizing than others. Whichever phrase you choose, this is tech industry shorthand for the use of one’s own products. More specifically, it’s when a company uses its own products to find and resolve bugs. Like customer testing, dogfooding provides a much-needed opportunity to iterate on meaningful, real-world product feedback before launch. Why “dogfooding?” The term comes from a well-known 1976 television spot for Alpo dog food, starring actor Lorne Greene. By feeding Alpo to his own dog in the commercial, it’s become the symbol (and the namesake) for trialing a product internally before it goes to market. Nearly 40 years later, “eating your own dog food” is a widely accepted practice inside most organizations. When does dogfooding occur in product development? If a company is running employee and customer tests, employee tests will usually come first. Some, for example, designate the Alpha Phase to employee testing and the Beta Phase to customer testing. Ideally though, teams would maximize the value of their testing program by conducting both customer and employee tests throughout product development. Who submits feedback for dogfooding? The vast majority of your dogfooding recruitment will focus on employees. But just as you’d align your ideal testers with your customer test objectives, the type of employees you should aim to recruit will depend on your goals. If your objectives are largely technical, you want employees with an appropriate technical field of expertise – people from Engineering, Quality, or Dev. It’s especially helpful if they’re unfamiliar with your current project. On the other hand, less technical objectives lend themselves to less technical roles. Marketing and Sales, for example, can bring their wealth of knowledge about your target audience into your project. Your colleagues and co-workers. These are people from every corner of your company who perform all manner of tasks. Executives, board members, or key shareholders. These are your organization’s managers, VPs, and directors. Inviting them to participate in your dogfooding program is a good way to generate buzz, as their influence carries across the entire organization. Knowing who to target is only half the battle – reliable recruitment and test engagement can be very challenging when it comes to establishing a high-return dogfooding program. We’ll speak more on how to alleviate the difficulties of employee engagement in the third part of our Dogfooding Best Practices series. Where does dogfooding live within an organization? Quality Assurance. Employee Product Testing often surfaces defects or software issues, and this department validates those quality aspects through bug discovery and code evaluation. They are therefore common candidates to run dogfooding programs. Since this team is closer to engineering, they may struggle with clear communication to testers. But since they are directly involved in product development, they have substantial influence during product creation. Support. This team interacts with customers and supports them through issues they encounter. They have an optimal blend of customer service and technical backgrounds to manage Employee Product Tests. That said, this team may have a hard time fully integrating into development processes because they typically come in post-release. They may need more direct influence during the creation of the product. Product Management. While this team has the most strategic view of the customer, business, and technology, they tend to have less time for managing dogfooding projects. Company leaders often assign dogfooding projects to these teams because they own the product to begin with. Because of this, they can leverage the collected feedback and project insights more directly. User Experience (UX). This team has a nice balance of design and customer focus, with special attention to user behaviors and product interactions. Because they’re invested in the end-users’ experience, they make good candidates to manage employee Beta Tests. It gives them an opportunity to gather insights, improve designs, and understand more about interactions. At the same time, this team may deprioritize defects since they don’t often influence or interact with bugs in code. Because of this, other teams may need to step in to synthesize the results so everyone can leverage the value of testing. How do you improve your dogfooding efforts? Both your product and your organization can benefit enormously from dogfooding – we’ll dive into the ROI of eating your own dog food in next week’s blog post. But oftentimes it’s a lack of the essentials – a solid framework, reliable engagement processes, and continual nourishment – that makes it difficult for many dogfooding programs to see progress. If you’d like to increase the value of your dogfooding efforts, you can start by downloading our newest e-book, Essential Tips for Dogfooding Success. Take advantage of its best practices for boosting employee engagement and increasing stakeholder buy-in today. Special thanks to Centercode’s Outbound Coordinator Maria Kapitan and her dog Myles for posing in the cover photo of this week’s blog post.